Bad boy Vic Salazar breaks all the rules except one: Don’t make a move on your best friend’s girl. It’s a Guy Code that Vic lives by. It doesn’t matter that he’s had a crush on her for years. Monika Fox is off limits. I’m a big Simone Elkeles fan, and I enjoyed the first in the series, so I picked this one up shortly after its release date. Prior to starting this I was debating whether or not to re-read Better Than Perfect, but considering that novel featured Derek and Ashtyn, and this one featured Vic and Monika, I figured it would stand on its own. I didn’t like Monika, which was a huge drama for me, because I have to like a female character to connect with the novel. My main issue with her was that she was never introduced as a unique character. She was introduced as Trey’s girlfriend and then a character under the control of her parents and her illness. She was never introduced as having any really likable qualities – I found her to be very “young” and incredibly hard to connect to. The whole “book likes girl, girl likes boy, we’ve been friends for ages” is a story line I don’t particularly like. The problem with a pre-established relationship is that the reader doesn’t get to see the two characters meet and come together as a duo. Instead the reader is thrown into the story and expected to automatically believe that something has happened before, we just didn’t get to experience it. I had the same problem in Jennifer E Smith’s Hello, Goodbye, and Everything in Between – there was pre-existing relationship there, but because I didn’t experience the two characters falling in love, I just couldn’t believe it. The same thing happened in Wild Crush. I understood that Trey was Monika’s boyfriend and Vic was a long time friend, but it didn’t feel real to me, because I didn’t read about it happening. Instead it all felt forced and unbelievable. Because of that, I didn’t like and couldn’t sympathise with the characters. There was a lot of whining going on and when I wasn’t annoyed with the whining, I was annoyed because I couldn’t understand where their emotions were coming from. I’m still a big Simone Elkeles fan, but I’m starting to think that she maybe peaked with her Perfect Chemistry series. 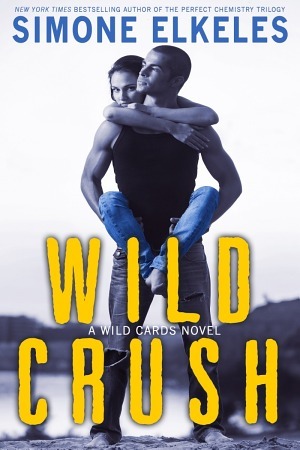 This entry was posted in Book Reviews and tagged 2 stars, book blogger, book review, contemporary, ebook, love, romance, simone elkeles, young adult. Bookmark the permalink. Why don’t you read some “grown-up” novels? These reviews are all starting to sound pretty much the same and is it any wonder? The plots are similar. It’s hard to love a book when you don’t like the main characters. A shame that happened for you in this one!